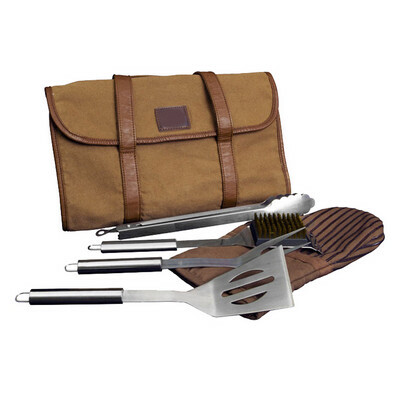 Description: Be the envy of the neighborhood with our professional grill tool set; featuring a heavy duty stainless steel spatula, fork, tongs, grill brush and an oven mitt. The tools fit conveniently inside a handsome canvas carrying case, complete with straps that make it easy to transport your tools to any backyard BBQ party. Unleash your inner grill master!. . Colours: Brown. Decoration Areas: Laser Etching.